Agumon X is an altered version of Agumon that carries the X-Antibody Factor : Agumon in its Digicore. Agumon X enhances its dinosaur traits, becoming more saurian in nature. It gains elongated claws on its hands and feet, its tail grows more pronounced, and it gains blue markings. Agumon X was added to Korean Digimon Masters on August 22nd, 2018. 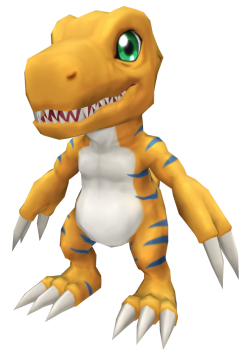 Agumon X was added to Global Digimon Masters with the September 11, 2018 Patch. Concentrates flame and shoot it at the opponent. Spitfire Fire attribute 7 seconds cooldown 21 DS consumed 2 skill points per upgrade Learned at Lv. Spout fire breath from its mouth. This page was last modified on 21 April 2019, at 05:29.